Italian-American dishes are what we crave and what we make, what we order and what we wax rhapsodic about. The last century has seen hundreds of inspired new dishes take their place at the table, alongside traditional preparations, resulting in a cuisine that is as current as it is classic. At last, here is the place to look for the tastiest and most definitive renderings of Shrimp Fra Diavolo, Steak Florentine, Pasta alla Primavera, Linguine with Clam Sauce, Spinach with Pignolis, Tiramisu and all the other treasures of the Italian-American table. In these pages, America's premier restaurant critic, John Mariani and his wizard-in-the-kitchen wife, Galina Mariani, update and perfect all the classics in lighter, less creamy-and-cheesy versions made with the freshest of ingredients. The Marianis make a convincing case that Italian-American cooking, far from being a watered-down version of Italian cookery, is a full-fledged cuisine in its own right. 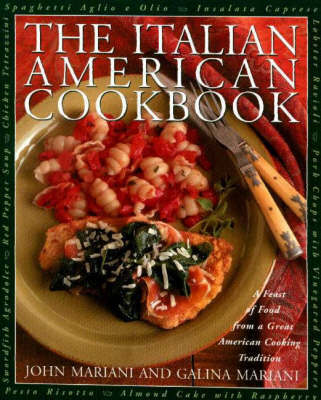 In fact, as they show in a fascinating introduction, many elements of Italian cuisine in Italy today are actually imports from the Italian-American repertoire. In 250 recipes, they reveal not only how glorious that repertoire is but also how its basic elements may be used in innovative new ways - in a Risotto with Apples and Saffron, for example, or a Pork Roast with Fennel. This is a feast of food, from antipasti and soups through pasta and pizzas all the way to dessert and also of history and folklore, in the dozens of sidebars and archival photographs that bring to life the family restaurants and home kitchens where these magnificent dishes are prepared and enjoyed.